Breathtaking and tranquil. Hidden from view beneath the desert landscape on the Navajo Nation Reservation lies Antelope Canyon, a cathedral of natural beauty. Antelope Canyon is really two separate “sister canyons” that have been carved over millions of years by the water flow from Antelope Creek. Antelope Canyon is located on the Navajo Nation Reservation just south of Lake Powell, east of Page, Arizona USA and not far from the Grand Canyon and its wonder. 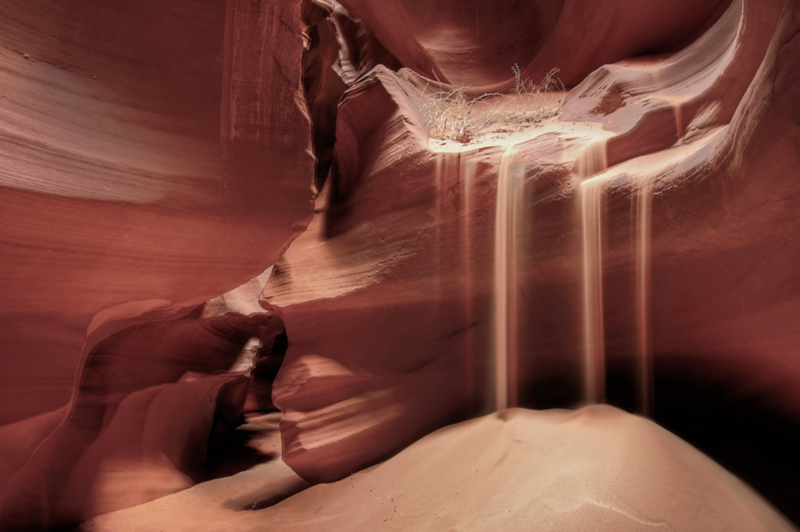 The “Upper Canyon”, called “Tse’ bighanilini” by the Navajo meaning “the place where water runs through rocks”, is most popular of the two canyons and one of the most photographed spots in America where the stream bed runs 120 feet below the surface.